Any USB-C hub will work with your iPad Pro, but they all have really short cables. 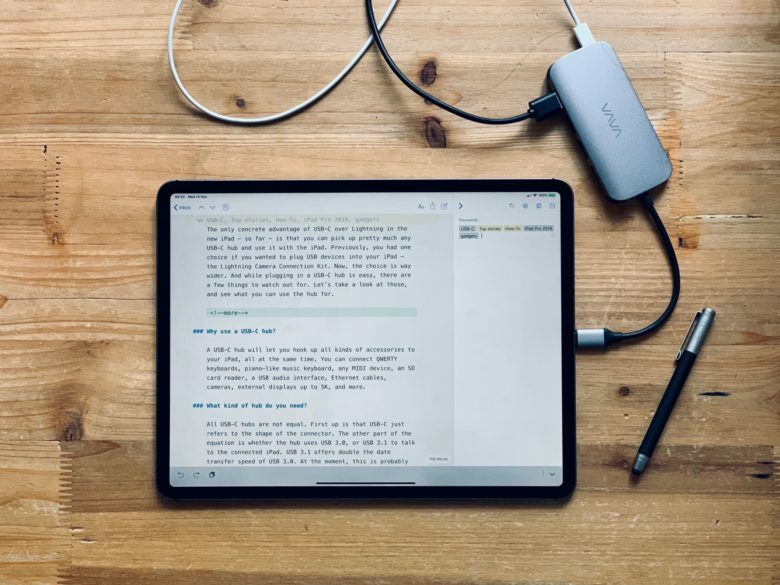 The only concrete advantage of USB-C over Lightning in the new iPad — so far — is that you can pick up pretty much any USB-C hub and use it with the iPad. Previously, you had one choice if you wanted to plug USB devices into your iPad — Apple’s Lightning-to-USBC camera connector. The choice is way wider for 2018 iPad Pro owners. And while plugging in a USB-C hub is easy, there are a few things to watch out for. Let’s take a look at those, and see what you can use the hub for. Why use a USB-C hub with iPad Pro? A USB-C hub will let you hook up all kinds of accessories to your iPad, all at the same time. You can connect QWERTY keyboards, piano-like music keyboards, any USB MIDI device, an SD card reader, a USB audio interface, Ethernet cables, cameras, external displays up to 5K, and more. What kind of USB-C hub do you need? You can connect almost anything to your iPad Pro with a USB-C hub. Almost. All USB-C hubs are not equal. First up is that USB-C just refers to the shape of the connector. The other part of the equation is whether the hub uses USB 3.0 or USB 3.1 to talk to the connected iPad. USB 3.1 offers double the data-transfer speed of USB 3.0. At the moment, this is probably only of interest to photographers who move huge files, or a lot of files, from their camera to the iPad. If all you’re doing is hooking up music gear, or a keyboard, this doesn’t really matter. Even USB 2.0 is more than enough for that. Another factor to consider is USB-C cables. There are several kinds, rated for different power levels and speeds. The one that Apple supplies with the iPad, for example, can transfer data, but only at USB 2.0 speeds. Longer cables are slower: For the maximum USB-C speeds, you need a cable that is a meter ( feet) long or shorter. Most USB-C hubs come with a short tail that plugs into your iPad, so you don’t have to worry about that part. Just make sure to check the specs on any hubs and cables you buy. USB-C cables may all look the same, but they’re not. The most important thing to look for in a USB-C hub — apart from the configuration of ports — is a pass-through USB Power Delivery (PD) port. This lets you hook up a USB-C charger to the hub, which will then power the connected iPad. Without this, the iPad will have to power all the connected devices, running the battery down and limiting your connected gadgets to a power draw of 7.5 watts (the maximum the new iPad Pro can supply). You can use the power adapter and cable that came in the iPad’s box to supply the power. These are the most common, but there are more. You also can get hubs with VGA adapters, for example, which seems crazy in 2018. Obviously, you should pick the hub that has the ports you need. But don’t go overboard. Because most of these hubs have a short tail, they will be hanging off the side of your iPad, so you also want something small. Ask yourself if you are ever going to use Ethernet or an external monitor. Then balance this future-proofing with what you actually need right now. 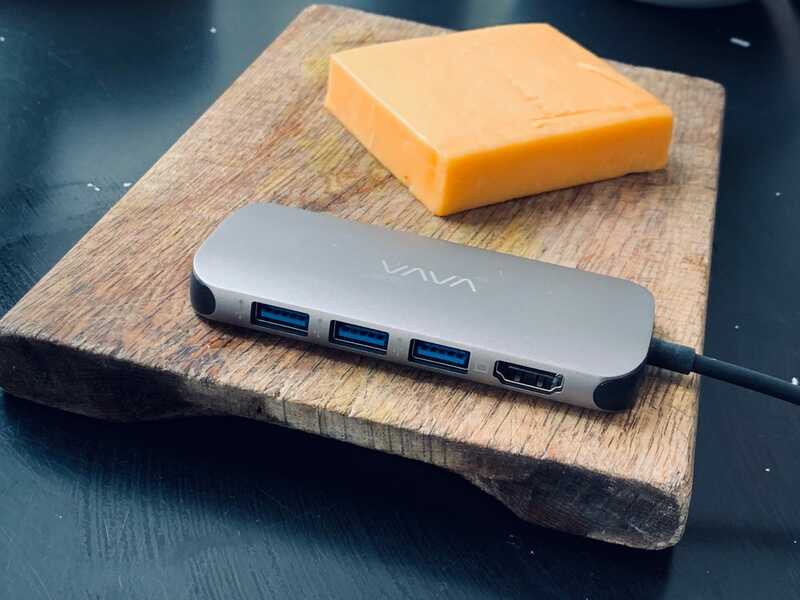 I bought an eight-port Vava USB-C hub for my iPad Pro. It comes with three USB ports, HDMI, SD, miniSD, Ethernet and pass-through power. I use it to connect quite a few devices to my iPad, including a USB MIDI keyboard and an audio interface. But because you can plug a regular old USB hub into one of the USB-C hub’s ports, you don’t need as many as three. In reality, what I needed was one or two USB ports and Power Delivery. That, and a longer cord so the hub can sit on the desk. I could then plug an SD card reader into the hub on the rare occasions I need one. For a good guide to USB-C hubs, check out the always amazing Wirecutter. And for USB-C accessories in general, check out our own guide. Note: We originally published this story on November 14, 2018. It has been updated.